Every year the Ann Arbor and Ypsilanti district libraries choose one book for a program they call Ann Arbor/Ypsilanti Reads. The purpose of choosing one book is "to promote reading and civic dialogue through the shared experience of reading and discussing a common book." This year the committee chose Ruta Sepetys's Between Shades of Gray, which if you know me at all, you know how much I adored this book. And not only did I love it, but despite the fact that historical fiction is a hard sell to students, this book got passed around like a hot potato last year in my classroom (and I'm sure it would this year too if I had a classroom). Kids couldn't read it fast enough to pass it off to the next reader. It was never on my shelf. 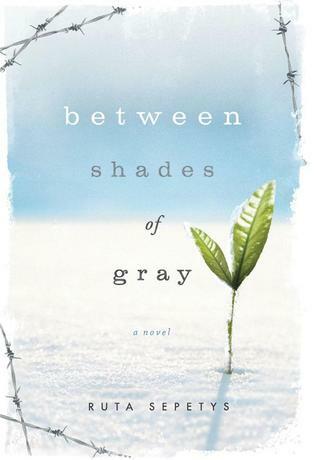 I heard Ruta speak in 2012 when Between Shades of Gray won the Amelia Elizabeth Walden honor at the ALAN conference at NCTE in Las Vegas. 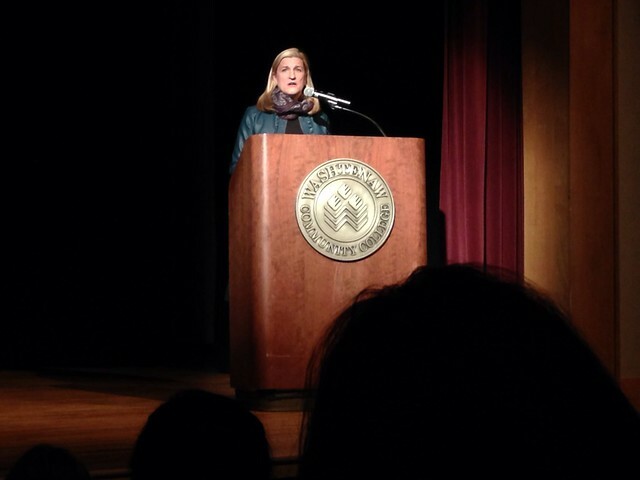 Her speech moved me to tears then as it did on Tuesday night when she addressed a full auditorium at Washtenaw Community College for almost two hours, talking about how the book came to be, and what it has meant to readers all over the world. came along with it, how the voice of one woman she interviewed, Irena, came back to haunt her as her agent was looking for a publisher. One publisher passed on the book because they said, "Well surely if this really happened someone else would have already written about it." Irena's words suddenly rang in her ears: "Ruta, this book will never be published. History has forgotten us." As Ruta talked about the difficulty of the process of interviewing survivors, eventually she realized she needed to stop asking questions and just ask, "What would you like to share with me?" One man said to her, "I have seen hell and it is white." That's when she discovered she would never get responses that telling by asking specific questions and just had to let them tell their stories. "I wrote the book, but it's not my story." Meaning, this story belongs to history and to the people of Lithuania.
" Together, we're adding a chapter to history books." "History divided us, but we're united through reading." Referring to the fact that this book has helped bring conversations among cultures that might not have ever happened before. Good fiction has us ask questions but doesn't force answers. The people in attendance asked such wonderful, thought-provoking questions, such as the man who wanted to know if the book, which is published in 30 languages and 46 countries, is published in Russian. It is not. Rather telling, don't you think? I know I tend to say this at the end of every author event recap, but I always mean it: if you ever have a chance to hear Ruta speak, please do it. She is a passionate, dynamic speaker who will get you thinking about reading and history in new ways. Despite the fact the Between Shades of Gray is a work of fiction, it has helped bring an era of history out of the dark and into our consciousness. 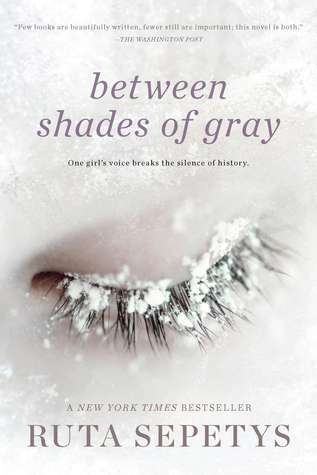 Read my review of Between Shades of Gray.